We finally raised our first batch of turkeys here at Clucky Dickens Farm—9 Broad Breasted White and Bronze turkeys that I basically fell in love with, and promised we’d have every single year on our farm from now until eternity. Now that we’ve made it through our first turkey butchering experience, I’ve come up with five turkey butchering tips to share with you. What I will tell you is that if you’ve butchered a chicken, you can totally butcher a turkey. The birds are put together the same way—a turkey is just much larger. In fact, some people like butchering turkeys better because the body cavity has more space in it so there is more room for your hands during evisceration. Ready to hear my five turkey butchering tips? Spoiler alert—they all focus on pretty much one thing: turkeys. are. big. Turkey butchering tip #1: Think out your plan of action for dispatching. With chickens, my oldest grabs a chicken, holds it upside down by both feet and brings it to the kill cone. But chickens are much smaller than turkeys. I won’t lie. My 14-year-old was more that slightly concerned that he would need testicular protection if he even thought about carrying a live turkey upside down by both feet. Especially since a friend confirmed that her husband would have appreciated having said testicular protection during their most recent turkey butchering day. I mean, have you ever been beaten with turkey wings? We considered our options. Because we are hunters, a friend suggested a shotgun or an arrow. Another friend suggested an ax and a tree stump. In the end, when it came to dispatching, it was me who gathered the turkeys from the coop. Why? Because they knew me as food lady, they liked me, and stayed calm. (Farm life is rough, yo. The circle of life.) I stood over them and gave them a big bear hug from above, making sure I had their wings pinned in with my arms. Then I carried them out of the coop. I’m not usually involved in the march of death, so that was a little different for me. But I think it was the most humane way for it all to happen, so yes, I think it worked well. Would we do it this way again? Yes. As long as the birds aren’t 137 pounds, I think this will be our plan from here on out. Turkey butchering tips #2: You need a bigger kill cone. At some point it occurred to us that neither Jimbo nor his friends were going to fit in even the largest homemade kill cone that we had. We had some friends that told us using a feed sack with a corner cut off works well for a turkey kill cone. Another friend suggested a traffic cone. But you know us. We have to try something different. So my husband found a 15 gallon barrel in our shed and said, “I have an idea”. With some cutting, the use of a heat gun, and some special nuts and bolts, we created our first prototype for a giant kill cone. It was definitely big enough and they fit inside with room to spare, but unlike chickens, the turkeys were so powerful that when they started flopping around, they tried to kick themselves out of the cone—and sometimes succeeded! We had to stand there until they stopped moving to make sure they weren’t going to flop themselves out of it. My husband suggested that with a little tighter fit they wouldn’t be able to move as much. Yes, although I am interested to know next year if hubby’s suggestion of using one a little bit smaller will work better. Turkey butchering tips #3: Make sure your scalding kettle is big enough. My husband thought he remembered a large kettle in his parents’ garage and we went ahead with our plan to use that as the perfect size to dip a giant bird in before plucking. Well, you know how plans go. As it turned out, The large kettle was no longer in existence (having rusted out and been taken by another family member to use as a flower planter). So we sat and thought about our other options. And then, my husband had another idea. Why, yes. That is brand new metal 30 gallon garbage can on a propane burner. I will admit I was skeptical of this. I thought putting a metal garbage can on a propane burner was a guaranteed way to start our entire property on fire. But it worked awesomely, and my husband was even gracious enough to not say I told you so. It took more time to heat the water up than if we were using a 30 quart turkey fryer type kettle. But once that baby was ready, she worked slick! There was a slight amount of dripping from the bottom seam of the can (that was the same moment we saw the label on the can that said “for dry storage only”) but as soon as the first turkey was dipped to scald, the leaking stopped. My husband assumes some feathers and “stuff” came off the turkey and plugged the seam. Absolutely. My husband said he would like to solder the bottom seal just for assurance. He also said that next time, he would put the garbage can up on blocks and put the burner underneath (instead of the can sitting right on the burner) so there would be more air flow. But aside from that, we are both in agreement that this was one of our best choices during our first turkey butchering fiasco. Turkey butchering tip #4: You need to know when you’re planning to butcher turkeys. While you can slack off and move chicken butchering a week or two without much problem, you’re going to be in trouble if you do the same thing with turkeys—especially the Broad Breasted Variety. Turkeys are big. I think I’ve mentioned that already. There is a big difference in butchering a bird that dresses out at 4 pounds and one that dresses out 20 pounds larger. We have had a few friends who waited too long to butcher and ended up with turkeys so big they couldn’t fit the dressed bird in the roaster (or even the oven!) without cutting them in half. We butchered 9 turkeys at 21 weeks. We got 164 pounds of meat from those 9 birds. Our largest bird (Jimbo) dressed out 24 pounds. Our smallest bird (significantly smaller than the rest, who tried to convince us she was actually a chicken) was 13 pounds. We use poultry shrink bags at our farm. They are easy to use and look so professional! Click on the picture to read more about them. Turkey butchering tips #5: Make room in your freezer. You guys, turkeys take up a crapton of room. Let me give you a visual of 8 turkeys in one of our freezers. Did I mention three weeks after the turkeys were butchered, we needed to have room in our freezers for three pigs? We have four freezers on our farm. And having full freezers is a great problem to have. But seriously, y’all—make sure you have room in your freezer(s). 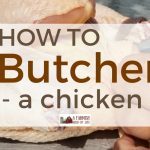 There you have it—five turkey butchering tips from our first experience butchering turkeys at our farm. Hope they were helpful! If you have any turkey butchering tips to share with us, please do so in the comments! Thank you for sharing your experience with butchering turkeys! 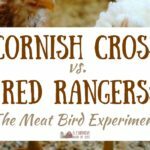 This is definitely informative and gives a short but good look into how things work when your meat is raised at home. These tips were VERY helpful! Especially #4 with the age and approximate weights. We’re considering ordering some with our chick order but we’re doing the research in advance. If we move ahead with this idea then our butcher day would be beginning of August! Thank you for sharing!